Get Involved in The Great Science Share! The Great Science Share is a national campaign to engage young people in sharing science with new audiences and there are so many ways you can take part! This is the focal point for schools and their communities to engage young people in sharing science with new audiences, where young people will share their learning from classrooms, outdoor explorations, clubs, schemes or competitions in a way that engages and reaches out to people in their whole school community. WIN with Cheshire & Stockport Science Learning Partnership! Cheshire & Stockport SLP is supporting the Great Science Share. They would love as many schools as possible in Cheshire & Stockport to get involved. If you tag @slp_EatonBank or email [email protected] to let them know what you are doing, your school will be entered into a draw to win a place at one of their courses! THE GREAT SCIENCE SHARE 2018! 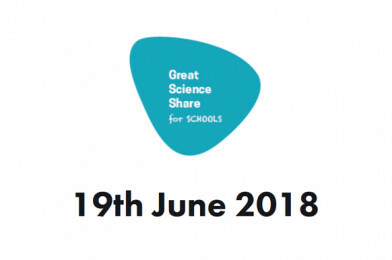 The Great Science Share for Schools will take place on Tuesday the 19th of June 2018. A lead event will take place at the Whitworth Hall (The University of Manchester) with satellite events taking place in schools and other locations across the UK. Everyone is able to do a Great Science Share in their school or organisation. Young people from early years, primary schools, secondary schools and FE colleges. Support can be offered by University students and community groups, including STEM Ambassadors. Why was this campaign created? To inspire young people to share the science they enjoy in their own words and ways. To encourage learning, engagement, creativity and confidence in science. For young people to reach new audiences and inspire them. For young people and schools to feel part of nationwide buzz about science developing aspirations towards careers in science and engineering. Diary the 19th of June 2018 and plan it into the school calendar. Look at what you do already to promote science in school and make it part of the Great Science Share for Schools day. If this day is really problematic, aim for some time that week. You don’t have to be in Manchester to take part. Express interest by emailing [email protected] and you’ll receive relevant information, updates and branding packs. You’ll be able to sign up officially from mid-February. Follow @GreatSciShare on Twitter and tag #GreatSciShare in your activity and preparation posts. The sharing should be about young people sharing with other young people. It’s about the young people taking charge of sharing, whether it’s face-to-face or online, and to reach out to a new audience, if possible. What is a ‘new audience’? The new audiences could be other young learners, other schools, their families, or the wider community. Teachers, schools, parents, community groups, organisations working with schools. However, the science shares should be designed and delivered by young people. Why should we get involved? It’s a time of year when we have lots to celebrate and lots to share. A share can build on work that young people are doing or have already done for other STEM initiatives. Science embraces all subjects on this day – science, technology, engineering, maths and computer science, even linking with the arts and humanities to share learning together. It’s about celebrating the scientific and creative process of working scientifically – the young people sharing their investigations! Are there some examples of how this could work for different age groups? – The Big Science Busk: every child in the school/year group develops a ‘busk’ and showcases at home time! All types of media and resource could be used to share: drawings, photos, collages, videos, floor books, child-led demonstrations, talks, presentations, group activities, assemblies, twitter, website blogs, talking photo albums. How do I get involved – I’m a scientist, charity, society, business? • Let the team know you’re interested by emailing [email protected]. You’ll receive information and links to support you. • Link with your local primary school and ask how you can work with them to support children to share their science investigations, projects and activities on 19th June 2018. • Volunteer to be part of the ‘Great Science Share Chauffeur-a-Scientist’ where scientists chauffeur themselves and colleagues visiting one or two schools on the day of the 19th June 2018. How do I get involved – I’m a parent/carer? The University of Manchester’s Science & Engineering Education Research and Innovation Hub spearheads this event, in partnership with BASF, Manchester Museum of Science & Industry, The Primary Science Teaching Trust, The Comino Foundation and many STEM Organisations and advocates across the UK.